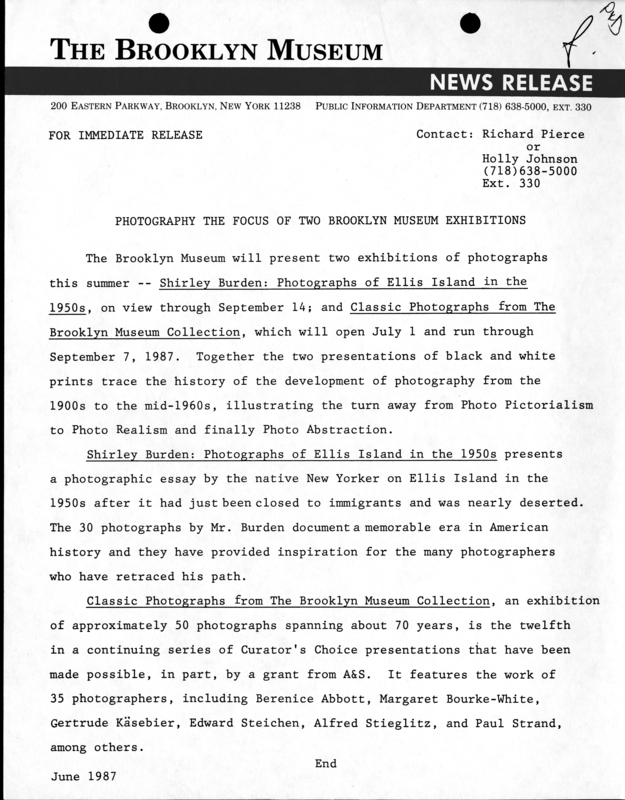 June 17, 1987 The Brooklyn Museum will present two exhibitions of photographs this summer -- Shirley Burden: Photographs of Ellis Island in the 1950s, on view through September 14; and Classic Photographs from The Brooklyn Museum Collection, which will open July 1 and run through September 7, 1987. Together the two presentations of black and white prints trace the history of the development of photography from the 1900s to the mid-1960s, illustrating the turn away from Photo Pictorialism to Photo Realism and finally Photo Abstraction. Shirley Burden: Photographs of Ellis Island in the 1950s	presents a photographic essay by the native New Yorker on Ellis Island in the 1950s after it had just been closed to immigrants and was nearly deserted. The 30 photographs by Mr. Burden documenta memorable era in American history and they have provided inspiration for the many photographers who have retraced his path. Classic Photographs from The Brooklyn Museum Collection, an exhibition of approximately 50 photographs spanning about 70 years, is the twelfth in a continuing series of Curator’s Choice presentations that have been made possible, in part, by a grant from A&S. It features the work of 35 photographers, including Berenice Abbott, Margaret Bourke-White, Gertrude Käsebier, Edward Steichen, Alfred Stieglitz, and Paul Strand, among others. Brooklyn Museum Archives. Records of the Department of Public Information. Press releases, 1971 - 1988. 1987, 058.